SunBridge has created a wide array of unique, proprietary tools to help you succeed in the role of a SunBridge 3-GEN Planner. Our tools are practical, fun, easy-to-use, and effective. They are elegant, yet simple. They fit seamlessly within a busy practice. They actually work with real clients and real advisors. As a SunBridge 3-GEN Planner, you teach a teenage grandchild how to conduct a “Priceless Conversation” interview with his or her grandparent, then listen in the wings as it actually happens. Imagine witnessing a grandchild’s delight in uncovering his grandparent’s stories and a grandparent’s pride in sharing his life’s wisdom. As a SunBridge 3-GEN Planner, you lead an “Angels & Heroes” activity for an entire multigenerational family. During the exercise, each person’s honest and authentic value system is discovered, shared, and appreciated. Imagine the impact of carefully weaving this insight into the family’s 3-GEN plan. As a SunBridge 3-GEN Planner, you guide a three-generation client family through a real-life philanthropic adventure using the “Main Street Giving Game.” The experience draws the family together and changes the lives of everyone involved. Imagine them discovering what makes each one come alive and recognizing their power to make a difference in their communities. As a SunBridge 3-GEN Planner, you facilitate a “Time to Think Council” in which the family’s knottiest issues are artfully, thoughtfully, and respectfully dissected and resolved, to the amazement and satisfaction of all. Picture a family learning — perhaps for the first time — how to talk to each other about difficult subjects without it turning into a shouting match. As a SunBridge 3-GEN Planner, you make sure that a large bequest from a parent or grandparent is not a “Sudden Money” event, because you prepare the children and grandchildren to receive it long in advance. As a SunBridge 3-GEN Planner, you get paid for connecting families and changing lives. Your work is richly rewarding, in every sense of the word. All of these tools mentioned—“Priceless Conversations,” “Angels & Heroes,” “The Main Street Giving Game,” “The Time to Think Council,” “Your Life in a Brown Paper Bag,”and many, many more—are exclusively available to members of the SunBridge Network. We invite you to join today, and then come to one of our upcoming workshops to discover how to use them elegantly and effectively in your practice. 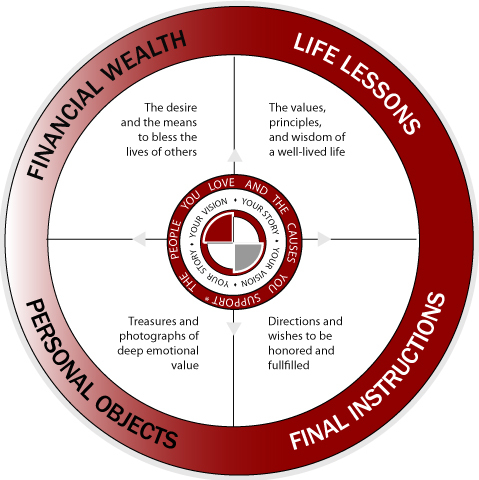 A conceptual model that identifies the key components of a legacy filled with passion and purpose, and how the various components should fit together. Family of Tools Priceless Conversations are the perfect tool to conduct a brief but deeply meaningful conversation with your clients about the issues that are on their minds and in their hearts. It allows them to share the stories and life-wisdom that most define who they really are and what they most want to convey to those they love. help you, as their advisor, to create richly significant and appropriate plans for them and to offer more appropriate counsel. A one-to-one or group sharing technique that invites deeper sharing and deeper introspection, helping us recognize the wisdom in all of us. You can create a warm, uplifting experience with any group, using a set of “wooden nickel” tokens tucked inside a real wood “treasure chest” or a cloth draw-string “booty bag.” Share memories and life-lessons during donor meetings, family reunions, and office retreats, or as appreciation gifts. A powerful piece about the importance of serving, giving back, and leaving a legacy for those who come after us. A group introductory exercise that promotes a depth of connection in a few minutes while allowing participants to connect with and share their heritage and their most important values. A one-to-one or small group activity that facilitates the discovery of each other’s deepest self and the discovery of what really makes us tick, through the use of small personal objects and the stories behind them. A presentation built around the “Turning Point” video that helps us see the potential impact of the small acts—and the small objects—in our lives and the lives of others. A one-to-one or small group activity that uses a thumbnail sketch of the major events of a lifetime to deepen understanding of the person and how they deal with life transitions. A presentation with beautiful graphics that explores how we can leave a legacy using all of our wealth—both financial and non-financial—to tell the story that will be left when we are gone.